last week, four women, each in separate rooms ... one kept asking what guest was walking around in the middle of the nite and who is staying on the third floor ... no guest on third floor ... all deny visiting the third floor in the middle of the nite. as they check out, two tell me they saw something in the library and do we have a ghost? one of the women with them gets upset and doesn't want to talk about anything like that. but this gets other guests going .... and has me worrying i have an animal in the walls. well, all guests leave and i'm cleaning rooms and stop for a rest and what do you think? i hear what sounds for all the world like footsteps upstairs on the third floor. so, up i go (as in 'don't go in the basement') calling 'hello?' thinking maybe a guest has come back but i find no one. up to the attic and into the cupola. no one. shrug it off and get back to business cleaning on the second floor, bring down the laundry and as i pass the library i glance in to be sure there isn't trash to be thrown out and see a shadow cross the room. THE SHADOW the women i saw i guess. i can't figure where it comes from but ... i guess we have a ghost in the house. and a practical joker of a ghost at that. I don't even know what the last few people wrote because I can't get past the photos of the bats. I almost would hope that it's a ghost, too. I obviously can't DO bats. I can't even scroll past a few photos on my computer without getting icky about it. OK... seriously... was there any wind that day? Do you have anything loose up there? Like maybe a shingle that flaps up in the wind, then falls back down (thud)? Or a weather vane that flaps around? Or an electrical cord to a lightning rod? Or do seagulls ever land on your roof? For the library... was it a partly cloudy day? The kind where clouds go over the sun quickly? Or do you ever have low flying aircraft? (They also block the sun briefly at times.) Or even flocks of seagulls or some such... don't know if they'd be dense enough to block the sun. Frankly, I'm not a believer in ghosts. I do think that there are spirits (angels and demons) and that spiritual things are real, but I get pretty cynical about ghosts. oh sure ... lots of reasons for sounds on the roof. seagulls galore. feathers float down all the time. i am accustomed to the sounds the seagulls make on the roof, i even know the sound of one in the chimney. loose pieces of ceiling in the cupola fall down, all of it. it's an odd old house. this sounded like footsteps over head ... going along the hallway toward the stairs down to me. if a visitor hadn't had to walk by me to get out, (and none did) i'd think a vagrant had been sleeping in the attic and was awakened by my cleaning. but, as i said, it's an old place and easy to shrug things off in the daylight. This is an excellent homeschool project. You can throw so much into it. 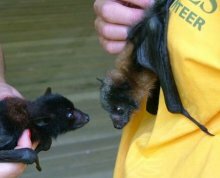 BTW more trivia for you - - on the playgrounds in Australia they typically have something called a flying fox. It is a cable you run and hang onto and race across about 100 feet of yard. It is unqiue to Australia adults love this too. Take a trip to Austin Texas in the Spring...take some chairs before dusk and go sit by the South Congress bridge. You will see a gazillion Mexican free tailed bats take off & go down the river. Now, that's some home schooling right there! They fly in colonies? Cool. Speaking of field trips, my technically/technology challenged parents will be dirivng I-40 all the back to the east in a few days from Vegas. Dad is finally convinced he will buy a GPS. He wants me to go look at them WHEN HE GETS HOME. DOH! DH just shook his head and walked out of the room. I tried to tell him they wouldn't even know how to turn it on. So I will do some small road trips with Dad and get him in the swing. Maybe he can use it to go to Wal mart or find a Denny's. LOL! Geography, Math - how many make a colony and breeding stats etc etc,science - diff types of bats their use etc, language arts - draw a picture and write a story about them, and lastly go on a field trip to a place that has bats! I love inquisitive minds...we learn what we are interested in, it prompts us to learn more! They are interested in bats. Heck so am I! Oh, he's so cute! Are they the size of a small cat? Numbers down: one of Melbourne's flying foxes. Plus they are BIG. Not the flapping unpredictable type bats we have. Big fluffy and cuddly. Yeah they still have those wings...covered in membrane. They are fruit bats. i am worried that it's a BAT! or a bat family. don't they cast shadows, and then nothing? do they make noise if building a house? oh gross! i can't think about it. give me captain gregg any day! but not bats!!! i've never had one in the house before. it must be a ghost. Now that is cool! Bats in the belfry. Bats aren't that bad... they're kind of cute up close. And, sorry, it probably is a more reasonable explanation of thumps and bumps. We've had them in both our house here and the one in Maryland. The one here was tough because I didn't know where he was... left the door open and went to bed and the next night he was back. Finally found him behind some drapes and got him out, poor guy. The bird down the chimney was much worse... had to clean the carpet afterward from the soot. Bats aren't that bad... they're kind of cute up close. You would love flying foxes in Australia. They are the most beatiful little guys. OK, I used to teach science... had a freeze dried bat someone gave me which I used in class. On the first day I came with a jar of maggots to pass around. Currently we have four crickets in a "bug house" for my "bug boy," which we've kept alive several weeks now. In comparison, bats are quite cute. They eat lots of mosquitos. We are always glad to see them swooping around outside. Inside... not so much fun. Hey, you know, you might be able to use this ghost thing to your advantage with PITAs, when you get them, do ghostly things to freak them out and make them leave... Dress up like Elvira, that might work too, especially for you Swirt! Yes, but he really hates pitas, so it could work really well for him! A ghost? How sleep deprived were you at the time?? hahahaha! Yell up the stairs, "Hey, while you're up there, strip the beds and check the trash!" He'll be gone for sure. Nothing worse than a lazy ghost. good one! 'hey you up there, get to work!' too bad i've closed off the third floor to guests for the year. ghost stories are fun and can be marketable, but then there are those who are terrified as you say and so won't book. Speaking of which, sort of, can you send me some more brochures? I'm all out and I was looking for one for that couple who wanted 'le view'. We have a pretty well documented ghost here and while many people know about her I don't make a thing of it because it really scares some people. I learnt my lesson when I told my father and my super-sensible, adored step-mother. She was petrified, started crying and wouldn't go back to her room alone. None of us, including Dad, knew she would react like that and I felt absolutely horrible. I will never, ever forget that and yet again learnt another lesson in making assumptions. My brother has been the site manager at Eastern State Penitentary, in Philly for a long time (he even wrote a book about it), which is supposedly one of the most haunted places in the world. It's been on Ghost Hunters and every other parnormal tv show, and he's constantly being interviewed about the 'spooky' instead of the historic apsect of the site. He has a pretty good answer. He always takes the tact that he is there day in and day out, sometime all through the night, sometimes alone, and has been for years and he's never seen anything. It's a good angle to bring living vistors though. Some people think of everything! The best line I've heard from another innkeeper when asked if there are ghosts in the inn.... "would you like for there to be ghosts here?" I like that one! I had guests tell me of another inn they left in the night because it was UNATTENDED by innkeepers, they were the only ones there and it freaked them out. They heard chains rattling and the whole scenario. The fled! I have a line when someone asks me that "No, but we have dead people buried out back" Which we do, an historical cemetary. That is also one of those, more than half the guests love it, they go back and try to locate people (like orig owners of this house) and read the old old stones. A couple FREAK OUT. A couple act as if it is a death wish if they walk past it. Hey QUIET NEIGHBORS! that is all I can say. Once the most beautiful music was coming from the cemetary, it sounded like angels signing. It was a church group singing at the graveside service, old hymns, accapella and it brought tears to my eyes! What a send off! If anyone were to have ghosts , it should be you! I have to say it like i always do, GHOSTS FLOAT right? They don't ahve bodies, they are spirits? Why do people hear movement and heavy footfalls and think they are ghosts? I would be more worried about a HUMAN BEING in the house. Would be nice to be told about birds and animals in the house wouldn't it. We had the squirrels in the attic (hey no jokes) and the birds nesting in the eaves. BIRDS are notoriousely loud B&B guests! Had the raccoon in the basement chew through the vapor barrier, the opposum mom drop her babies off her back into the pond, the deer in the yard, the bear walk down the street to the hospital, the "big ol' cat" prowling the park across the street at night (Bobcat - the old fella over there sprinkled flour outside his house and got the prints - smart man!) the stray cats, the lost kittens, oh the cat who slept in the guest room on their wedding night - who went up the outside stairs underneat her netting on her wedding gown, and ended up spending the night with her! The flying squirrel that was under this sofa in here - now that was exciting! I am sure there have been more...well of course "the smell" that happened three times. Dead something, once was a dead mouse who was running along the pipes and slipped and hung himself, another was trapped in our walls and we had to cut out the plaster to finally get to it. The mouse in the cottage eating all the chocolates and the guest who didn't even care - after I was stressed that it would run across her in bed! The loud crash outside that was a squirrel on the pecan tree who slipped, hit the metal roof and slid down to the brick path. All this in under 5 years and we are IN TOWN! If I could figure a way to put in that "spooky" sound here I would. SPPPPPOOOOOOKYYYY!! !